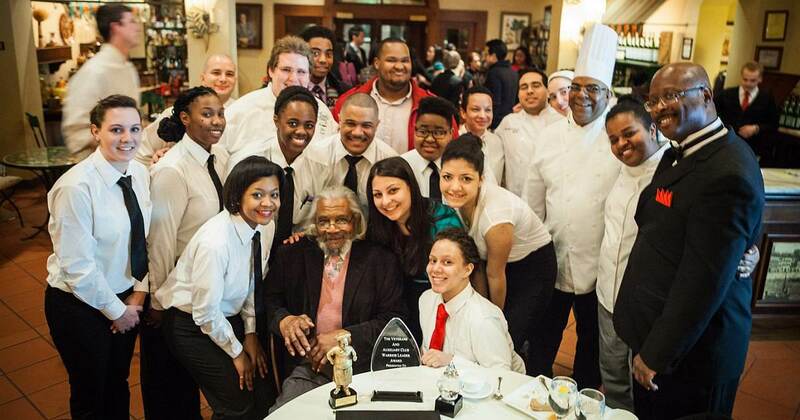 Jefferson Evans ’47, the first African-American graduate of The Culinary Institute of America, passed away in January at age 94. He has been called the Jackie Robinson of culinary arts, in part because Evans was a student at the CIA’s original campus in New Haven, CT before Robinson ever played a game with the Brooklyn Dodgers. The New Haven Restaurant Institute—which would eventually become the CIA—had just been founded to provide training and new skills to World War II veterans hoping to rejoin the post-war workforce. Evans, who had served in the U.S. Army during the war, applied and was accepted—after being turned down by Yale University. The Georgia native spent a lifetime working in various restaurants, finally opening his own, “The One ’N’ Only,” in New Haven in the 1980s. He also served as a chef-instructor at the CIA from 1970 to 1975. “Jeff the Chef” last visited his alma mater in 2014 for a special evening in his honor. The CIA chapter of the Black Culinarian Society (BCS), along with The Veterans Association & Auxiliary Club and The Word Poetry Club, joined together to celebrate Jefferson Evans and his career. During the event at the Hyde Park, NY campus, the BCS presented him with a Lifetime Achievement Award, the Veterans Association bestowed upon him its Warrior Leadership Award, and the Word Poetry Club gave him The Damien Williams Impact Award in memory of the club’s founder. Representatives of each student organization said they felt Mr. Evans had influenced them in a different way. “Of all of the awards I’ve been given, these mean the most because this is where it all started,” Mr. Evans said after receiving the three awards. Just last year, Evans self-published his autobiography, Why Do People Treat Me the Way They Do? The book’s foreword is written by CIA alumnus Alex Askew, who founded the Black Culinarian Society while a CIA student and co-founded the Black Culinarian Alliance—now BCA Global—which was originally an alumni chapter of BCS. Mr. Evans died at Yale New Haven Hospital, in the same city where, as a student, he broke down color barriers and began a successful culinary career.